Mainstream lifestyle focuses on family, wealth, beauty, sexuality and peer pressure, well depicted in media. Monks are people who say, “Been there, done that,” whether it was in a past lifetime or in a misspent youth (like myself). Most swamis born in India take the initiation before turning 30; Western swamis usually take longer to figure out that spiritual development is the most important thing in their life. I became a swami in my 60’s. You don’t have to be a swami to teach. There are many good yoga teachers and meditation teachers who practice deeply and continue their studies beyond their preliminary certification. Correspondingly, I was a good teacher before I became a swami. I lived a yogic lifestyle, based in my own home, focused on family relationships and working as a full time yoga teacher. I did my best for my students and they got benefit. My sannyasa (swami-hood) initiation was done at a Vedic fire ceremony, yaj~na. Facing God in the fire changes you. Ever after, swamis wear orange, the color of the fire. When I became a swami, all the other priorities fell away. I am forever grateful. Only one thing remains — Consciousness. A swami is not a priest. Priests are called “brahmins,” who perform religious ceremonies, including weddings, funerals and Vedic fire ceremonies. As important as this is, it’s religion, not yoga. Swamis are yogis, devoted to God but devoted to the God within. This is yoga, not religion. A yogi who attains yoga’s ultimate promise, and dedicates their life to serving others on the path, must be authorized by one who was authorized. Only then can they serve as a Guru. Not every swami is a Guru; some are still working on their own enlightenment. They simply have a deeper commitment and apply more of their time and energy to it. Not every Guru is a swami. Many of the yogic lineages feature married teachers, even passing their Guruhood on to their children as a family legacy. My tradition, Kashmiri Shaivism, is a Tantric tradition with several thousand years of swamis leading the way. Most Westerners have trouble with the long Sanskrit names, so most people call me “Swami.” Swami is the title of a yoga-monk. Sva means “Self,” your own Divine Essence, so swami means “one who is one with his Self.” Some people call me “Swamiji” (pronounced SWAH-mee-jee), with the -ji on the end being a term of love and respect. My given name is Nirmalananda, which means “the bliss of freedom.” My parents had named me Pamela, a precursor to my swami name, Nirmala. The names even rhyme! At the end of Nirmala is -ananda, which all monks in my vowed order get. It means bliss. What a beautiful promise is held in my name. Saraswati is the Goddess of Wisdom and Creativity. I am a member of the Saraswati order, as are most of the monks that brought yoga’s root teachings to the West. The Saraswati order is a teaching order, thus I teach. Technically, I am a member of the Mahanirvani Akhara, based in Mumbai and Haridwar, India. 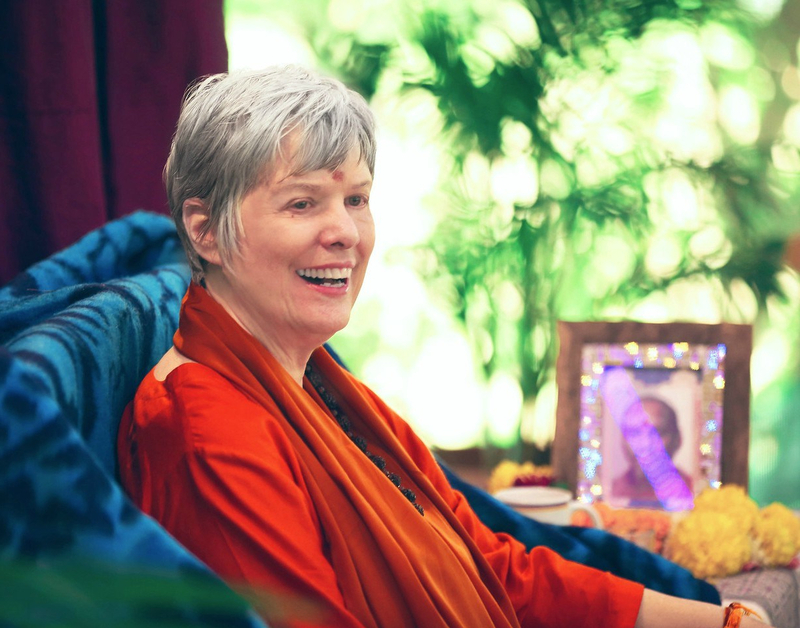 I lead two facilities in Downingtown PA, a residential Ashram and a retreat facility, as well as one in Varanasi India, where I am in residence twice a year. I have been authorized to share the depth of yoga’s timeless teachings, both through initiation as well as through teachings and practices. It is a privilege to serve spiritual seekers, to awaken them to a deeper dimension within and to make this time-tested technology available to a hungry world. As is traditional, most of my teaching programs are free, to make them easily accessible. I am deeply grateful to the international community of yogis who provide the financial support that makes my Downingtown locations possible and gives me the luxury of teaching for free. To share the highest with others, to give your heart and being freely, it’s a glorious way to live! This entry was posted in Ashram News on September 11, 2018 by Svaroopa Vidya Ashram. Reblogged this on light heart yoga ~ brisbane yoga classes ~ svaroopa yoga.